I just returned from my trip back East. It was a great trip, we saw all kinds of wonderful things, and the fall colors were amazing. Definitely one of the highlights of the trip was getting to try real Montréal bagels. We had time to try two bagels shops in the Mile End district: St-Viateur Bagel and Fairmount Bagel. Neither place was much more than a mixer, bench, a wood oven, and a cash register. You don't come to these places for the decor, just the bagels! But ... I don't know what it is, but I've never found myself just standing on the sidewalk lost in thought while munching on their bagels the way I did the Fairmount bagels. They were that good. Truly something to experience, if you ever get the chance! Never had one of these before being from NY but those look fantastic. Will have to try making some to experience them myself or at least come close. Thanks for sharing with us. Looks like you had a great trip! The bagels look simply fantastic! I seem to recall hearing that the montreal bagels are salt free, is that a false memory? Wow! I had not heard or noticed that, but it appears you are correct. I had no idea. I was in both shops last year and jokingly mentioned to the manager that the printer forgot to add salt to the ingredient list on his plastic bags. My mistake - as mentioned, both places don't add salt to their dough. Straight dough, not much ferment, hand shaped, boiled and baked in the wooden. Montrealers are passionate about politics, Montreal Canadians hockey team...and their bagels. I tried them both and wondered what all the fuss is about but didn't say this too loudly. Needs salt.... but from the daily lineups I noticed in both places, who cares what I think. 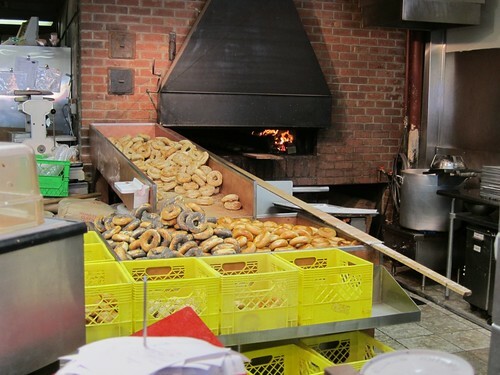 I loved them (the bagels), but as I said I really dig Siegal's Bagels here in Vancouver too. Though there is an election coming up, I'm pleased to say I didn't get into the politics while I was there. We did, however, catch a Habs game, which was a blast! Kouign Amann looks really good. I'll add that to the list for next time. Never had bagels, yet, but your description of the experience is very enticing. Thanks a lot for sharing the pictures, Floyd!